When I tell people that I write and like to study a culture that was born around 6,000 years ago, they invariable start making jokes about mastodons and caves. In actuality, the Sumerian culture was considerably developed, exceeding military technology that took the Egyptian culture a thousand years to reinvent. Sumerians also had a complex and well developed monetary system. In fact, the complexity of their rapidly growing, successful economic expansion contributed to the need for a new “technology” (writing) that would eventually make the exchange of goods practical for large-scale transactions. Nonetheless, before binding contracts, debts and slavery, and lordship developed, the monetary system had a long history of development. Plain tokens made their appearance with the beginning of agriculture; complex tokens, not until the rise of cities. The earliest assemblages of plain tokens have been recovered in the remains of villages of the Fertile Crescent dating to 8000-7500 B.C. These villages, built with round huts typical of the period of transition between hunting-gathering and farming cultures, relied upon grain consumption; they show no obvious evidence for animal domestication. They participated in a trade network, attested by the presence of obsidian tools at each site except one. The evolution of a reckoning device can logically be assumed to mirror the socioeconomic development of a society. It is therefore not surprising that the two major events in the development of the token system correspond to the two major economic transformations that occurred in the ancient Middle East:the invention of the counting device coincides with the transition to agriculture, and a quantum jump in the complexity of the system occurs at the rise of the Sumerian temple, which was to lead to state formation. Clay tokens, described by some scholars as the world’s first money, found in Susa, Iran have been dated to 3300 B.C. One was equivalent to one sheep. Others represented a jar of oil, a measure of metal, a measure of honey, and different garments. I don’t know how Sumerians were able to have a stable trade with tokens as it seems it would not be difficult to fabricate tokens in order to cheat. It is possible that each token had a value recorded somewhere in an official contract or other form of permanent record, but it’s hard to say from the sources I was able to find on the subject. The holes that you see in the tokens from the picture are so that presumably Sumerians were able to carry their currency as beads in a hard/stiff necklace called a bula. According to Smandt-Besserat, the tokens and the complex ways the scribes used to store them eventually gave rise to the system of writing: tokens were saved in clay “envelopes” that looked like large spheres. To remember the tokens that were inside each large envelope, scribes began to jot down symbols on the envelope, giving rise to the first rudimentary symbols. Although there is still some question as to whether writing first developed in Sumer or not (officially, it did, but for instance, the Dravidians claim that certain types of writing existed as long as 11,000 years ago), what is certain is that the Sumerian writing system was at first primarily used for drawing contracts and keeping careful accounting of traded goods and acquired assets. Royal contracts were validated with a cylinder seal. These were cylindrical stones carved with impressions that represented a particular royal house or lord, or highly influential member of society. The cylinder was rolled over the contract, leaving an impression of itself in the clay, and making the contract official. To some extent, the contract could be said to serve as an ancient “credit card” guaranteeing an equivalent in goods and services to those stipulated in the contract drawn for trade purposes or other legal reasons. The seals were used to “sign” clay tablet documents–in the case of the Spurlock seals, commercial receipts–with the unique seal of an individual such as the seller. They can be compared to a notarized signature today. The impression gave visual proof of the genuineness of the object. They could also be used on the clay “envelope” containing the receipt or letter to prove no one had tried to open it since it had left the merchant’s hand. Stamped onto a person’s possessions, a seal impression could identify ownership of the object. They were also useful in business to protect closed containers from tampering or theft or to seal storerooms full of grain to show if the room had been broken into or not. But ancient cylinder seals had far more uses than just as signatures or tamper-proof seals. They also stood for the owner and thus had a secondary use as amulets to protect the wearer from harm or use in medical and magical rituals. Often, they had a decorative function when stamped on clay pots, etc. If made of semi-precious stone, they could also have value as jewelry to be worn and were often included in a person’s valuables at burial. Rulers also used them to give their kingly authority to written decrees, and pass their authority on to underlings to do business in their name. 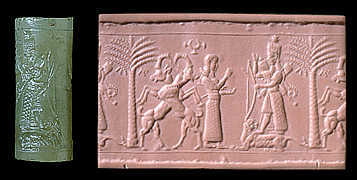 A cylinder seal showing Inanna and the lion. Nonetheless, beyond the contracts that were validated by cylinder seals of royalty, the standard of Sumerian currency was silver, not gold. According to many sources, the value of silver was fairly stable, thus making it a reliable ore to stabilize what would otherwise be a complex and wildly fluctuating barter market, whereas otherwise, in order to buy apples, one would have to know the equivalent value in oranges, oil, grain, parts of a goat, or other goods. From this, I surmise that women (and men) probably continued the practice of wearing types of jewelry that also served as currency. The lowest denomination was a “shekel”, then a “mina” and finally a “talent.” One mina equaled 60 shekels. One Talent was equal to 60 mina. These coins were used to pay for property, buy goods and services, pay fines, pay taxes, etc. This coinage was arranged according to the sexagesimal numbering system which had been developed earlier by the Sumerians (ie 1, 60 [1×60], and 3600 [60×60]) where one talent is equivalent to 3600 shekels or 60 minas, and 60 shekels is equivalent to one mina. The mina weighted about 500 gms., and the talent about 30 kgs. 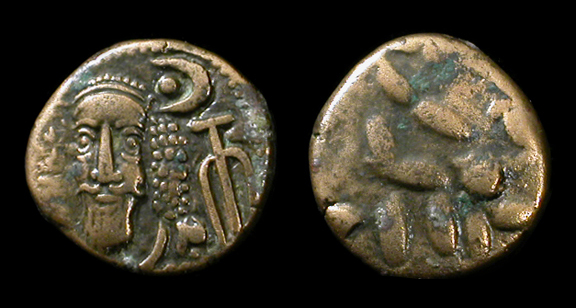 Kramer notes: “The more industrious of the artisans and craftsmen sold their handmade products in the free town market, receiving payment either in kind or in “money,” which was normally a disk or ring of silver of standard weight (1012).” Quoted from the website The Jeredite Origins: Sumerian Money. So it seems that it wasn’t money, necessarily, that was the root of all evil, but rather the development of necessary evils like hard labor, debt, slavery and lordship, prostitution and organized systems of governance that gave rise to money.